"I'd say do it and do it now. A DOT cannot buy this kind of knowledge and experience in such a short period of time." Fiscal Year 2005 has been an exciting time for those of us involved with Accelerated Construction Technology Transfer: more than one-half of the States have now engaged in the ACTT process, some multiple times, and over 40 percent of the remainder are actively considering the process for fiscal year 2006-2007. By working together, we are helping bring renewed creativity to the highway planning, project development and construction process in departments of transportation nationwide. Our reasons for titling this report ACTT NOW are simple. First, this report provides a synopsis of ACTT, showcasing the growth of the program and the continuity of ACTT efforts since inception. Second, this bulletin documents the change in ACTT from an FHWA and American Association of State Highway and Transportation Officials (AASHTO) Technology Implementation Group (TIG) pilot effort to a mature program owned and operated by the States. AASHTO and FHWA will continue as resource agencies for the States as you institutionalize ACTT, but we no longer "own" this process. You do, and the possibilities are limitless. So, as we prepare to pass the program off to our owner States, we do not see this as the end: it is, in fact, the beginning of a new way of doing business, one that enables State departments of transportation to incorporate an innovative approach to highway construction into your daily operations. The results - reduced construction time, improved safety and elevated project quality - will garner benefits for years to come. Simply put, ACTT has arrived, and it is here to stay. No one person or organization serves as the driving force behind ACTT: Accelerated Construction Technology Transfer is a collaborative effort in the truest sense of the word. It works because it brings together public- and private-sector experts from across the country in a setting that encourages flexibility and innovation. The ACTT concept was originated by the Transportation Research Board (TRB) in conjunction with FHWA and the AASHTO Technology Implementation Group (TIG). Following the completion of two pilot workshops in 2002, one in Indiana and one in Pennsylvania, the originating task force, A5T60, passed the concept off to FHWA and the TIG to continue the effort. Since 2002, FHWA and the TIG have worked with Federal, State and industry partners to bring ACTT to departments of transportation nationwide. They have done so by creating a leadership team that draws upon the expertise of national skill set experts, all of whom give of their time to help make the rapid transfer of technology a reality. As State departments of transportation prepare to assume ownership of ACTT, FHWA's Office of Asset Management stands ready to assist with this process, making the transition a seamless one. Throughout the entire process, the goal is to minimize costs and impacts for an important part of the "who" group - the highway user. With an increasing number of highway construction projects underway nationwide, State departments of transportation are looking for innovative ways to reduce construction time and traffic congestion and to"Get In, Stay In (and get it done right), Get Out and Stay Out." The ACTT program helps owner agencies achieve these goals by bringing national transportation experts to the planning table. A structured workshop is the centerpiece of the ACTT process. Once a State indicates that it wishes to host a workshop for a specific project, it must identify the project timeline, goals and skill sets. Using this information, the State invites national experts to their workshop for two days of intense brainstorming and discussion. At the end of those two days, each skill set provides counsel on innovative ways to accelerate construction and minimize impacts to the community. "We found the ACTT workshop useful in identifying means to reduce costs and timeframes, particularly during construction." 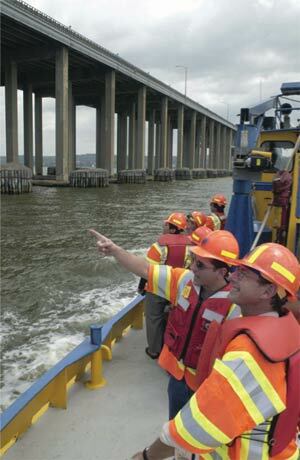 "The workshop exceeded our expectations and gave the Thruway the rare opportunity to gain insight and suggestions. The Thruway would welcome the opportunity to participate in this important workshop in the future." "Having hosted a workshop, we quickly learned that solutions that we originally thought to be risky were actually applied elsewhere. We gained ‘immediate experience' through face-to-face technical discussions that provided the encouragement to try new/different methods for project approach and construction methods." Deciding when to host an ACTT workshop is perhaps the biggest challenge facing State departments of transportation. "The timing of the workshop [prior to selection of the preferred alternative] allowed full consideration of most ideas developed and allowed us to actually change the design and method of construction as needed…. We would recommend holding the ACTT workshop at this stage again, if possible." "We held our workshop when the designs were pretty well on to being done so that we could incorporate suggested changes into the final design. Perhaps the time to do it would be when the plans are about 30 percent complete. We were at about 80 percent, and that did limit us." Other host agencies relate comparable results. Georgia hosted an ACTT workshop for their urban HOV lanes project before concept development had begun. Jan Chandler Hilliard, design group manager for GDOT's office of urban design, says that concept development "is a good stage; however, some database work and initial environmental surveys should be done in order to present to and brief the design (geometric skill set) team, especially if they are not familiar with the corridor." Finally, Tennessee hosted a workshop for their urban I-40/James White Parkway/Hall of Fame Drive project as final plans were nearing completion, says John T. Hunter, project manager for the Tennessee DOT. According to Hunter, this limited the number of new recommendations that could be utilized. Because of their experience, Tennessee would recommend that upcoming workshops be held early in the preliminary plans stage. Participation in ACTT is growing by leaps and bounds, with 20 states hosting 21 workshops to date. Six workshops are scheduled for the remainder of 2005 and the beginning of 2006, with another 11 under consideration for 2006 and beyond. Travelers across the United States are encountering unprecedented levels of highway construction as Federal and State transportation agencies work to rehabilitate an aging transportation infrastructure. Using ACTT, State departments of transportation are searching out innovative ways to shorten construction time and reduce project costs, oftentimes by as much as 30 percent or more. The result is that millions of dollars and years of disruption have been shaved off highway construction plans and projects. "I'd say do it and do it now. A DOT cannot buy this kind of knowledge and experience in such a short period of time. Get a workshop planned early in the project development process to get a full range of project approaches and solutions so that the most expeditious construction method can be employed. This will avoid the dreaded ‘ if I had only known this before I started.' 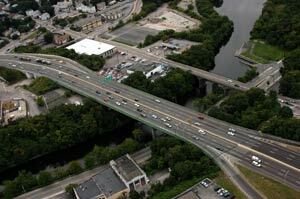 "
Using ACTT, owner agencies are using innovative techniques to reduce construction time and minimize impacts to highway travelers on a variety of urban projects, including the Pawtucket Bridge No. 550 project in Pawtucket, Rhode Island. For owner agencies, hosting an ACTT workshop is as simple as 1, 2, 3. Select a corridor or major project: ACTT is most helpful when applied during the project development phase. Make a workshop proposal to ACTT team members, and submit a copy of your proposal to the FHWA Division Office. Include details on the project corridor, timeline and goals. Hold a pre-workshop meeting with the ACTT management team. Select a meeting site, and coordinate workshop details with the FHWA Division Office. Host the workshop. Draft a report for submittal to FHWA. Incorporate ACTT recommendations into project development. Is this project a candidate for major reconstruction and/or rehabilitation in the next 4-6 years? Have the purpose and need been identified? Is there an urgent need to accelerate construction? Is the team open to innovation and willing to consider and apply fresh concepts? ACTT Now! 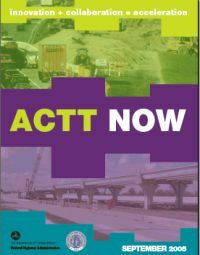 A full ACTT Implementation Guide is available at https://www.fhwa.dot.gov/construction/accelerated/. Visit today, or contact James Sorenson at (202) 366-1333 or james.sorenson@fhwa.dot.gov to begin your ACTT workshop.